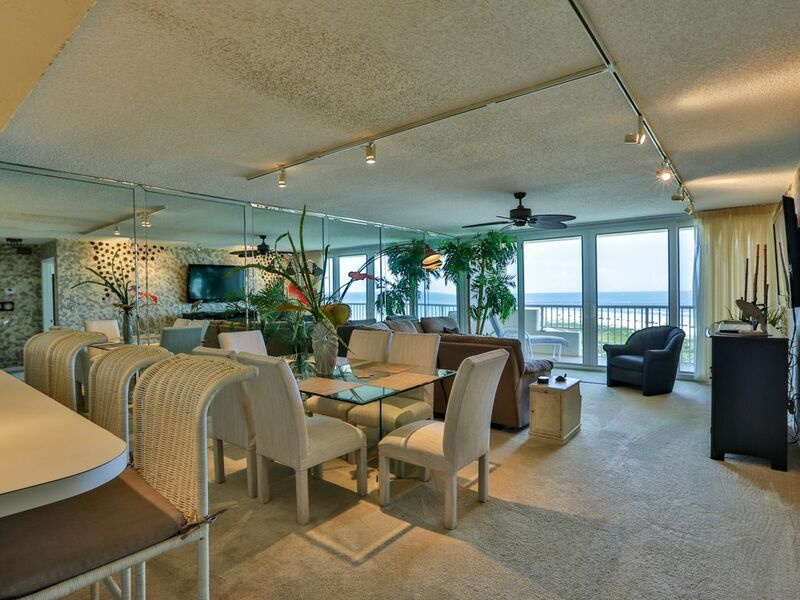 you with panoramic views of the ocean, the inlet, turtle dunes, rock pier, and lighthouse. Look no further...this is your getaway vacation! most prestigious resort in the area. Enjoy your amazing views from the master bedroom balcony, or from the living room balcony. Towels and wash cloths provided for both bathrooms. Underground parking. Assigned parking space next to elevator. Tremendous location! Access to everything! Super clean! Amazing new furniture in the master bedroom and the views are undeniably the best for the cost! You are close to so many great restaurants, pools that are never packed, beach outside the lower level. Can't say enough great things. Whether you are looking for a family getaway or a couples retreat, this will accommodate both. The best restaurants are The Garlic, and SeaShack the new Crow's Nest with breathtaking views and open air, breakfast at Beacon's or Wake Up Cafe. For a quick bite, the Taco Shack if fantastic. Enjoy your trip! Thank you for the great review Michael!! So glad you enjoyed another stay at our Florida beach home! We thoroughly enjoyed our stay at The Inlet. The condo is everything that we thought it would be and more. It had everything and the view is AWESOME. We plan to return as soon as possible. We are so very happy you enjoyed your stay in our Florida home. We have many repeat guests year after year and we welcome you back whenever you like. Thank you! So delighted that you enjoyed your stay in our beach home! Of course, we hope to have you again in the future. Thank you!! The apartment was cleaned properly for our arrival, the unit is well stocked. We do visit the same location a couple times a year, although not the most updated unit it was the cleanest so far. Beautiful view, clean pool and spa, friendly residents. We are happy you enjoyed your stay Cinthia. Thank you for choosing our beautiful home on the beach! not a bite of fishiness, even at the joints! We also rented a pontoon boat for half a day at Gerry's Marina next to Merks and buzzed up the intercoastal. Also love to rent bikes for a day and bike the beach and the town. Don't forget to go over the bridge and check out the rest of NSB. Can't beat it! We are so pleased that you enjoyed your stay in our home. Thank you for taking the time to review and for also giving other visitors such great tips about the area and where you enjoyed dining. Please come visit us again Holly! We thank you! Ocean Front at it's best!!!! What a terrific place! The info packet was full of information and the owner was so helpful and attentative before and after our trip. The kitchen was fully stocked with everything we needed for a super week at the beach! Super clean. We are a family of 4 who had a terrific Christmas in this condo. There is so much room and the balcony is large and private. The dining table hosted some killer card games. Open the sliders and let the ocean in or chill out on a lounge chair and relax. It is in such a quite area, but not too far from anything. The amenities of the complex are supurb. Walk on the boardwalk or the beach - watch the dolpins play around the inlet in the evening. Flagler Ave shops and restaurants are just 2 miles down the beach. We loved the Barracuda - Christmas dinner at a beach bar on the patio, you can't do that in Kansas. Thanks for some great family memories! So glad you enjoyed your holiday in our condo at the beach!! Thank you! Email me for a virtual tour! The Inlet condominiums are situated at the end of the beach (northern point) at a slant so that you can get panoramic views of the ocean, Ponce Inlet Lighthouse, Daytona Beach, and the federally protected Turtle Dunes. The Turtle Dunes have boardwalks intertwined throughout and it is a great way to spend your morning walking (or taking a run) and observing nature. If you want to take a break from the hustle and bustle of Disney and Orlando.....The charming town of New Smyrna Beach is the place for you! CANCELLATION POLICY: Written notice is required for any canceled reservations. A 10% administrative fee will be deducted from any available refund for all canceled reservations. No refunds can be given for early departure or lack of amenities beyond our control. Refunds will be provided per the schedule below: STAYS OF LESS THAN 1 MONTH: 60 or More Days Prior to Arrival: Refund of Pre-Paid Rent and/or Security Deposit less a 10% administrative fee and any non-refundable fees. Less than 60 Days Prior to Arrival: Forfeiture of rents paid to date. Less than 30 Days Prior to Arrival: Forfeiture of rents paid to date. STAYS OF 1 MONTH OR MORE: 90 or More Days Prior to Arrival: Refund of Pre-Paid Rent and/or Security Deposit less a 10% administrative fee and any non-refundable fees.